What features did the user click on ? Style is all about looking good. In this lab we are going to learn the basics of how to make good looking maps. The main thing to note is that we are calling a createStyle method to set a Style for the map layer. Let’s look at this method next. * Figure out if a valid SLD file is available. The methods that we’ve looked at so far are all we really need in this simple application. But now let’s look at how to create a style programmatically. This illustrates some of what is happening behind the scenes in the previous code. It also introduces you to StyleFactory and FilterFactory which provide a huge amount of flexibility in the styles that you can create. In the code below, the first method works out what type of geometry we have in our shapefile: points, lines or polygons. It then calls a geometry-specific method to create a Style object. In real life, it is common to have more than one Rule in a FeatureTypeStyle. For example, we might create one rule to draw features when the map is zoomed out, and another for when we are displaying fine details. This tutorial brings together many of the techniques and classes that we’ve covered in the previous examples. It is best if you have already worked through at least the quickstart, csv2shp and style tutorials. * with the mouse. The selected feature will be painted yellow. Much of this should look familiar to you from the style tutorial. We’ve added some constants and class variables that we’ll use when creating styles. A subtle difference is that we are now using FilterFactory2 instead of FilterFactory. This class adds additional methods, one of which we’ll need when selecting features based on a mouse click. 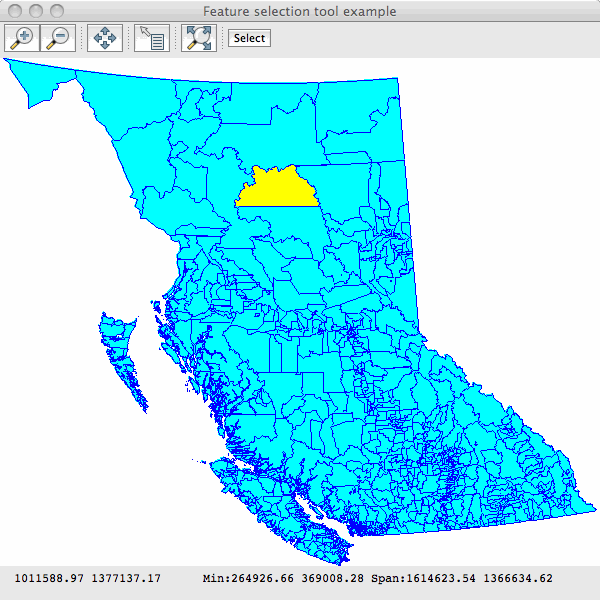 Next we add the displayShapefile method which is also very similar to the one that we used in style tutorial. * a custom feature selection tool to the toolbar of the map frame. * this application will exit. Note that we are customizing the JMapFrame by adding a button to its toolbar. When the user clicks this button a new CursorTool is set for the map window. This tool has just one method that responds to a mouse click in the map area. Next we’ll add the method that is called when the user is in selection mode (our custom toolbar button has been clicked) and has clicked somewhere on the map. The method first creates a 5x5 pixel wide rectangle around the mouse position to make it easier to select point and line features. This is transformed from pixel coordinates to world coordinates and used to create a Filter to identify features under, or close to, the mouse click. * the user has clicked on the map. * here but GeoTools also offers other, more accurate methods. The blue shapes are parts of a single MultiPolygon which is the standard geometry type for polygonal features in shapefiles. 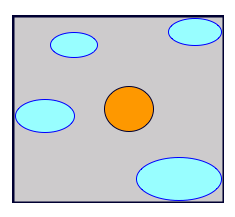 Using a bounding box filter, clicking in the orange shape would select it plus all of the blue shapes because the click region is within their envelope (the grey rectangle). * unselected features in the default style. This method creates a Style with one Rule for selected features, to paint them in a highlight colour, and a second Rule for unselected features. Both rules are then wrapped in the Style object. * yellow, while others are painted with the default colors. Note that the first Rule includes a Filter, created with the FilterFactory2.id method. This means the rule will only apply to the selected features. The second rule is flagged as an alternative (applies to all other features) with the setElseFilter method. OK, we’re nearly at the end ! Here is the method createRule. This is where the Symbolizer is created that describes how to draw a feature. Modify this application so that you can change the CRS in which the features are displayed. Now try to use the selection tool. You will find that it no longer works ! See if you can you figure out why the tool isn’t working and how to fix it. There is actually some amazing style generation code included with GeoTools. Add a dependency on the gt-brewer module and having a look at the ColorBrewer class. The class works by first asking you to calculate a categorization using one of the categorization functions on a feature collection; you can then pass the resulting categorization on to color brewer and it will generate a style for you based predefined palettes. Style is all about looking good, and this section is a box of crayons, learning how to make a map look good is the practice of cartography. Actually cartography is focused on using a map to communicate, choosing what information to include, being strict about removing information that is off topic and so on. Occasionally organizations will have cartographic standards that must be followed. How thick lines must be exactly, what shade of blue to use for water. Having a cartographic standard is a great time saver ‐ the rest of us are going to have to be creative. 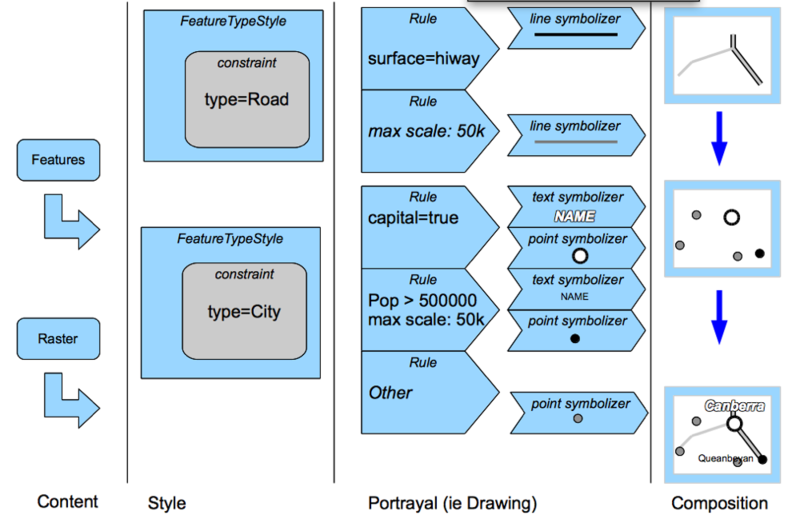 We do have one kind of standard to help us though: the Styled Layer Descriptor (SLD) standard ‐ this document defines a nice data structure for Style which we have captured in the form of Java objects. If you get stuck at any point please review the SLD specification as it defines all the ideas we are going to work with today. Covers the definition of “ layers ” or presentations of feature content. This is the heart of map making with GeoTools (or indeed with open standards). It helps if you imagine a big funnel throwing all the features at your map at once. This is going to work kind of like those machines for sorting coins ‐ early stages of the machine are going to select a feature; once we are sure what kind of feature we have we are going to use the feature to control actual drawing onto different bitmaps. Finally we will gather up all the different bitmaps (and slap some labels on top) to produce a final image. The first line of defence is “ FeatureTypeStyle ”, it makes use of a constraint to select what FeatureType you want to work with. If you don’t care use the FeatureType with the name Feature as kind of a wild card (since everything extends Feature ). Next up we have Rules. Rules actually use Filter (from the Filter tutorial) to perform strict checks about what is going to get drawn. In addition to checking feature attributes with Filter, a Rule is able to check the current scale of the map. Finally there is an Other rule to catch any features left over from earlier Rules. Now that a Rule has selected features for us to work with we can get down to drawing in the Portrayal step. The renderer will go through a list of symbolizers (for a Rule) and draw the results. The symbolizers are just a list of draw instructions to be done in order. The symbolizers use expressions to define width and color ‐ allowing you to dynamically generate the appearance on a feature by feature basis! The only symbolizer which is not drawn in order is TextSymbolizer which gathers up text labels for the next step. Finally in the composition step ‐ will take all the content drawn during portrayal and squish them together into a final image. The icing on the cake is the text labels (produced from any and all TextSymbolizers) which are drizzled on top taking care not to have any overlaps.